First, I mean, just look at these stanchions. They’re the kind with retractable belt dividers, so there’s no possible way that the belt would be sagging like this. 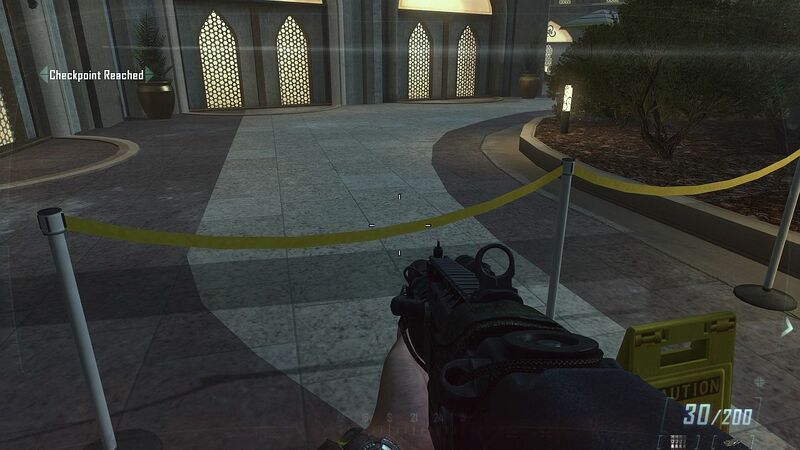 I like to think that somewhere, in the depths of Activision’s defect-tracking system, there’s a bug that reads, in part, “stanchion dividers should be taut”, and that I am personally vindicating the QA tester who filed it, fought for it, and to this day resents the fact that it was closed as WILL NOT FIX and also that he was laid off approximately 3 nanoseconds after the game shipped. Oh, and the second problem is that your character is a grizzled Navy SEAL type who has demonstrated nearly superhuman vitality and strength, but this pathetic little yellow belt is completely impassible. I’ve run into plenty of less-than-imaginative ways that level designers have designated areas as Off Limits To Players, but this is one of the sadder ones. I guess the caution sign DOES suggest that the floor past this point is slippery, so it’s a safety thing maybe? Wouldn’t want to slip or get mud on a freshly-mopped floor I guess.